Great on a weekend with the family. You don't have to buy an expensive cut of beef - a brisket can also be very nice if properly cooked. 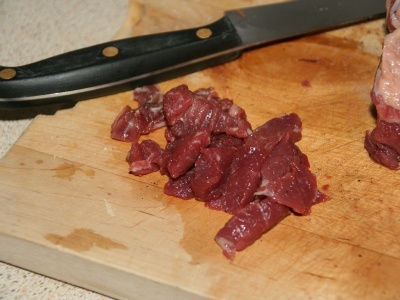 You will need more beef if you use a cut with bones or fat - e.g. brisket. It doesn't hurt to do some more - cool the left-overs in the fridge and cut it into thin slices for sandwiches. Please take into consideration that the core of the beef will still heat up once you have taken it out of the oven to let it rest. I tend to take my roast out at 58 degrees Celsius. After the 15 minutes resting, it is perfectly medium. If you don't have a meat thermometer, a rough guide is to cook for 20 minutes + 20 minutes for each pound. So a 3 pound roast will take 20 + 60 = 80 minutes. Great with Yorkshire puddings, roast potatoes, veg and a glass of red. Pre-heat your oven to 200 centigrade / 400 Fahrenheit / Gas Mark 6. Here is our roast - this time brisket. Our piece here weighs a good kilogram, so roasting time is 50 minutes if we still want it to be slightly red, one hour for well done but still juicy. I'm cutting off some beef for the gravy. If you have beef stock around, this is not necessary. Roughly 1/10th of the weight of the roast is fine for this. 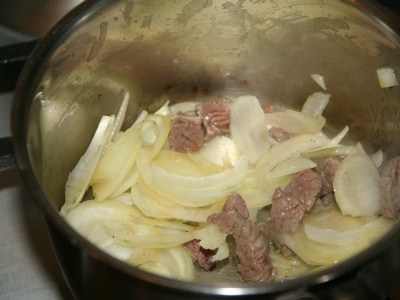 ... then add a finely chopped half onion. 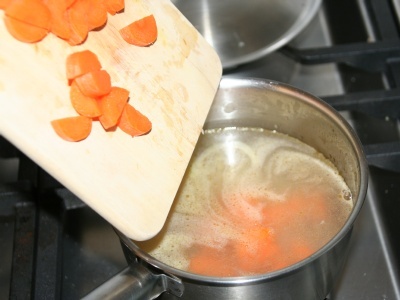 Add a glass of white wine and half a glass of water and a chopped carrot. 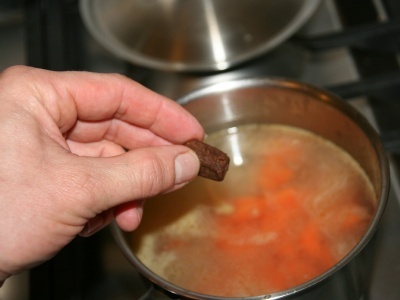 I still feel like it's cheating, but half a beef stock cube won't hurt. 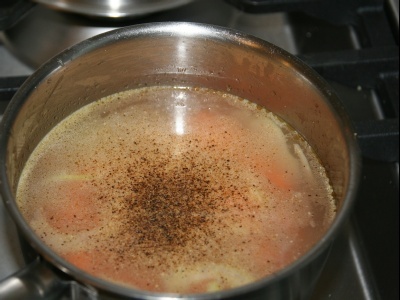 A couple of turns from the pepper mill and a bit of salt (careful here, the stock cube is quite salty in itself). 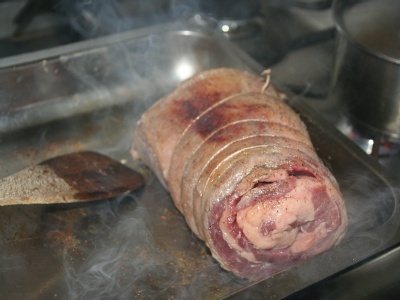 It is essential to close the pores of our roast before we put it into the oven. Salt and pepper the roast. Put the roasting dish on the hob, turn it up to full heat, add some olive oil to the roasting dish and put the roast in when it's hot. 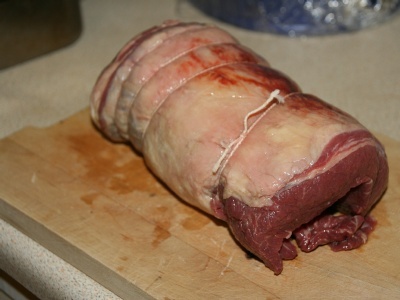 Turn the roast so all sides will be nicely browned and sealed. Then put the roasting dish into the pre-heated oven. Set your kitchen timer to the roast's cooking time. (Here, for 1 kg brisket, we want 45 to 50 minutes). After 10 minutes in the oven, turn the temperature down to 180 degrees centigrade / 350 Fahrenheit / Gas Mark 4. 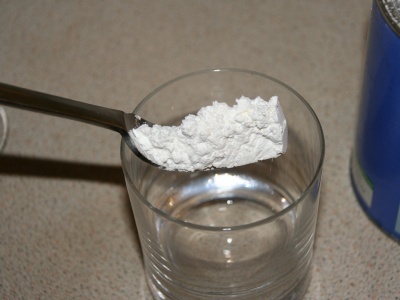 Whilst the roast is in the oven, put a fork full of corn flour into a drinking glass. We will need that later to bind the gravy. 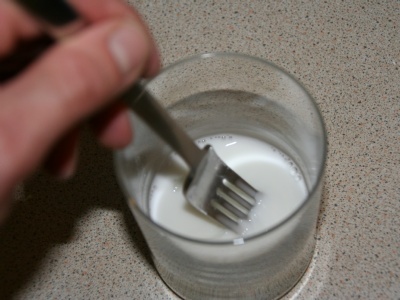 Add a bit of cold water and stir with a fork. 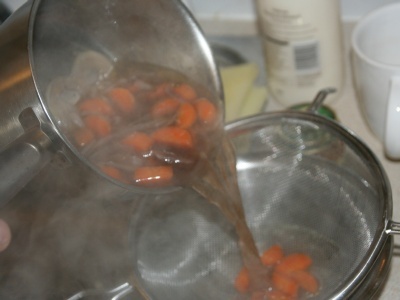 5 minutes before the roast is done, pour the stock through a colander. Throw away the bits left in the colander - they have done their duty, and, if properly done, will actually not taste of much any more. Their taste has gone into the stock - and that's where we want it.. Here is our roast straight out of the oven - looks lovely! 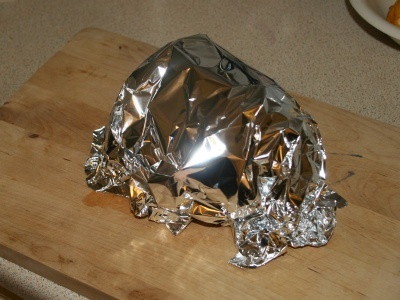 Put it on a wooden board and cover it with aluminium foil and let it sit for 15 minutes. 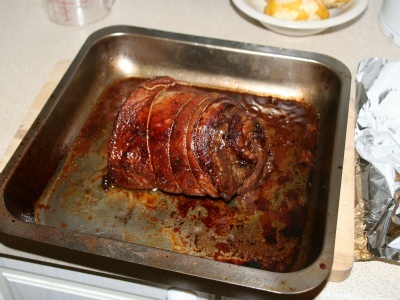 If you cut it up earlier, all the juices will just come out and you will end up with a dry roast. 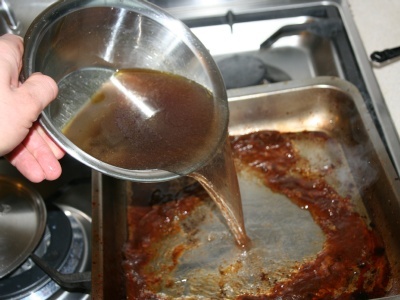 Pour the grease off the roasting dish. 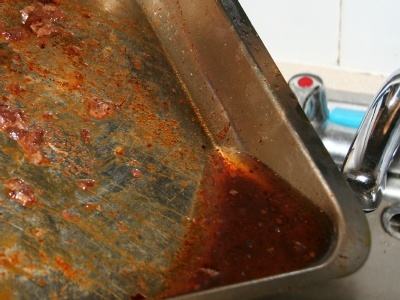 Be very careful here - we don't want to throw away the juices, only the grease. 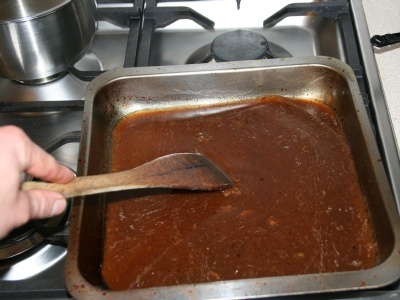 You can leave out this step if you have a gravy separator as shown below. ... and stir it whilst heating it up on your hob. You want all the nice brown bits to dissolve into the stock. 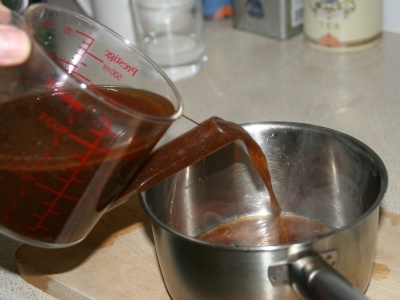 Pour the stock into a gravy separator. 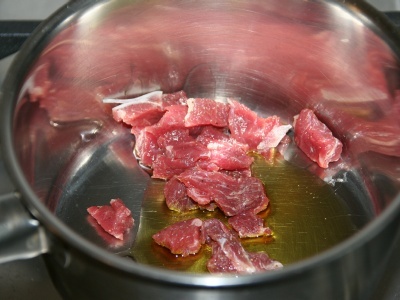 Then pour it into a small saucepan leaveing behind the grease. Boil up the gravy. When it's boiling, add the dissolved corn flour to thicken it. Please add it slowly as you don't want your gravy to bee too thick. Always bring to a boil after adding the corn flour to check. 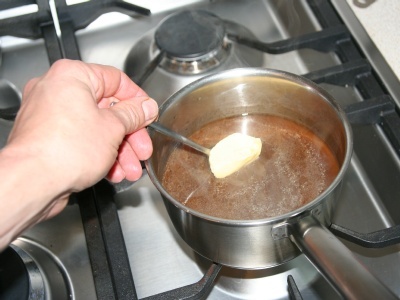 Finally, we add a knob of butter to the gravy. 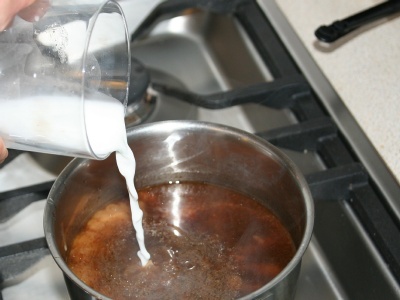 If you have some creme fraiche or sour cream in the fridge, add two teaspoons to the gravy instead of the butter. 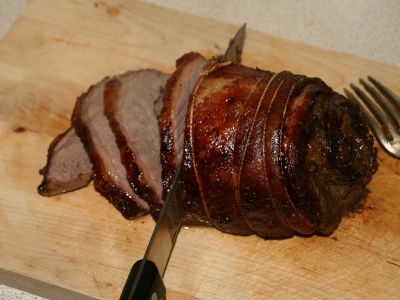 When the 15 minutes are up, cut the roast into thin slices. Serve and enjoy! 10 Sounds good. Will say tomorrow if it's as good as it sounds. 10 It's me again. It was so tasty last time all the family enjoyed it even my fussy son so I'm cooking brisket again following yr fantastic instructions. Thank you. 10 Thank you for this easy guide I was dreading cooking brisket as it's normally tough but it turned out gorgeous. Even my very fussy son aged 12 loved it. I'm going to follow more of your recipes from now on. 4 Seared beef, cooked very slow for 4 hours, rested for half hour and its like leather!! help! 7 We just had a make your own panini party last Sunday night with the falmiy. Everyone chose their ingredients and we had a lot of fun with it. I will have to blog about it later. I think you can put anything in a panini and it becomes fabulous by the melding of the ingredients and flavors. Blue cheese and beef sounds wonderful. 7 Amen, and amen. I've always been cncoinved that vegetarians are, ultimately, expressing that ancient Puritanical/New England Yankee cultural superiority that reeks of contempt for all things other . I will have my veggies AND my veal, my beans as well as my brisket. And I will be a Happy Man. 3 We just had a make your own panini party last Sunday night with the famliy. Everyone chose their ingredients and we had a lot of fun with it. I will have to blog about it later. I think you can put anything in a panini and it becomes fabulous by the melding of the ingredients and flavors. Blue cheese and beef sounds wonderful. 9 Its helpful as my brisket is 1kg. So will follow recipe and honey roast parsnips andd brocolli if time some roast potatoes. Never used brisket I usually roast topside or top rump but this was in a special with other cuta of meat. Here goes! 10 at last....someone who knows how to cook....many thanks...will be doing roast beef Sunday followed by Beef in Black Bean sauce Mon....now that is what I call food...many thanks. 10 EWX0sG Appreciate you sharing, great post.Really looking forward to read more. Great. 10 l179Bf Major thankies for the article.Really looking forward to read more. Awesome. 10 dgEfDh Really appreciate you sharing this article.Really thank you! Much obliged. 5 Any way to print this thing without printing all 15 pages?? The recipe sounds great though. 10 thank you for the easy recipe and instructions. did my first roast last weekend and i couldn't believe i did it! thanks a lot! 10 first time ever!!! absolutely delicious!!! definite keeper!!! 10 very nice and very easy to follow. thank you very much. 10 very nice recipie. thanks.